Rick Hafele caught his first trout on a fly at the age of 12 on a spring creek in Missouri. His interest in fly fishing and aquatic insects fully developed after he moved to the Pacific Northwest in 1969. Since then he has traveled throughout the West and beyond fishing for wild native trout, and collecting and studying the insects upon which they feed. Rick has a Master of Science degree in aquatic entomology from Oregon State University, and worked as a professional aquatic biologist for over 30 years, specializing in water quality assessment using aquatic insects. 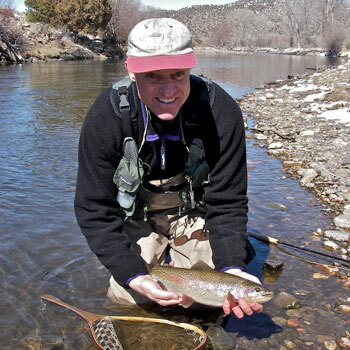 In the course of both his professional work and his fly fishing, Rick has spent more than 40 years observing aquatic insects and fish communities in creeks, streams, rivers, and lakes. Rick has written articles for scientific journals, and penned the Aquatic Entomology column for American Angler magazine for over 30 years. Books to his credit include An Angler’s Guide to Aquatic Insects and Their Imitations (with Scott Roederer, Johnson Books, 1995), The Complete Book of Western Hatches (with Dave Hughes, Amato Pub., 1981), Western Mayfly Hatches (with Dave Hughes, Amato Pub. 2005), and most recently Nymph Fishing Rivers and Streams (Stackpole Books, 2006). He has also instructed in eight fly fishing DVDs starting with the 1983 Scientific Angler release of Anatomy of a Trout Stream. His most recent DVD, Advanced Tactics for Emergers & Dries, was just released by Laughing River Productions in October, 2011 (www.laughingrivers.com). Rick is currently a member of the Freshwater Trust, the Native Fish Society of Oregon, the Xerces Society, the Western River Conservancy, and Water Watch. He has also been awarded life membership to the Federation of Fly Fishers and the Flyfisher's Club of Oregon for his contributions to fly fishing literature. He lives in Portland, Oregon with his wife Carol. Get a free issue of Rick’s newest project the online e-zine HookedNow at: http://hookednow.com . Each issue includes in-depth articles, plus video instruction, by Rick, Dave Hughes, and Skip Morris.